The Fiat 124 Sport Spider is a highly desirable compact convertible produced by the Italian carmaker from 1966 to 1982. Its classic design incorporates sporty performance with sleek European looks, to make it as fun to drive as it is good-looking. It could be driven with your choice of either a four-speed manual transmission, five-speed manual transmission, or a three-speed automatic transmission. Regardless of the powertrain your Fiat 124 Sport Spider will possess, it will be a joy to drive. Also, because a 2016 Fiat 124 Spider is in production, the classic Fiat 124 Sport Spider’s popularity has experienced a rebound, driving up its value. Here’s are some suggestions on how to buy a classic Fiat 124 Sport Spider. The most time-consuming part of buying a classic Fiat is finding a potential car that suits your needs. The Fiat 124 Sport Spider was sold in large numbers during its run, but many of the cars available are not original or not in excellent condition. 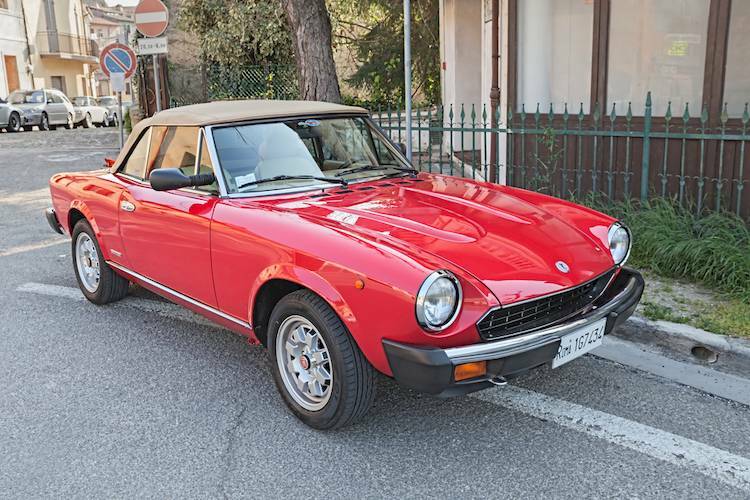 It can take weeks or months to find a Fiat 124 Sport Spider in top condition at a fair price. Step 1: Visit online forums to check for listings. There are several forums based in the United States for the popular Fiat model, and nearly all of them have a classified or “for sale” section with cars for sale. Locate the classifieds section on each site and browse through listings for Fiat 124 Spiders for sale. Listings are nationwide and possibly even in other countries, so be prepared to travel to purchase your Fiat 124 Spider. Step 2: Check car shows for a classic Fiat 124 Sport Spider. In warm weather, classic car owners congregate at car shows to show off their cars. Attend car shows and pay special attention to classic Fiat 124 Sport Spiders at the show. If there is one that catches your eye, approach the car owner and ask if they would be willing to sell their car. Classic cars are a source of pride for classic car owners, so be respectful if the owner refuses your inquiry. 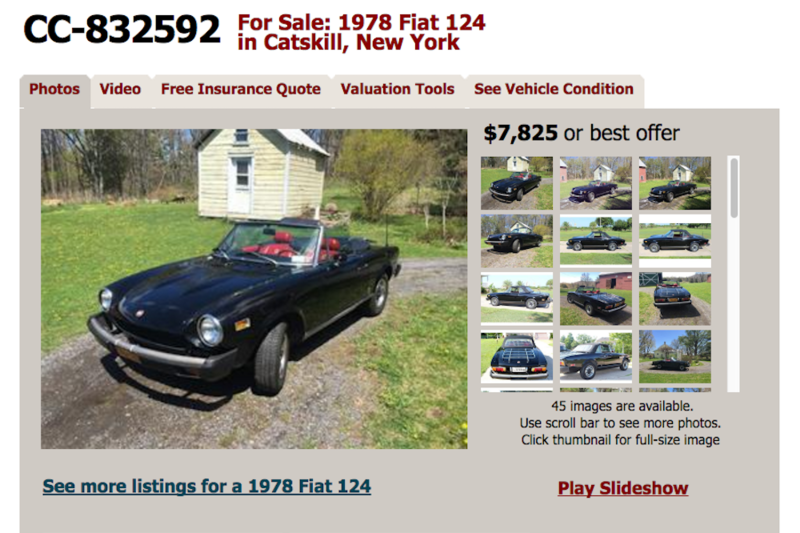 Step 3: Check classified ads for Fiat 124 Sport Spider listings. Check your local newspaper regularly for Fiat 124 listings. It isn’t likely that there will be many listed in your area, so if you find a classified ad for a Fiat 124, contact the owner right away to check it out before anyone else. Also check online classic car sites to find Fiat 124 Spider listings. Sites like ClassicCars.com and Hemmings will offer the best chances of finding classic Fiat 124 Sport Spiders for sale. Sort the listings to display only Fiat cars for sale. Browse the listings and make note of any ads you want to respond to. Step 4: Check that the sale price is a reasonable value. 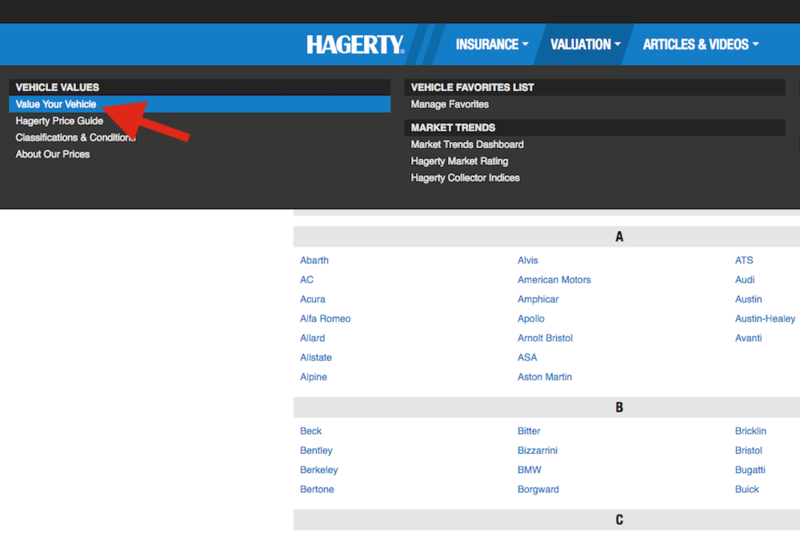 Use the valuation tool on Hagerty.com to check the car’s value based on condition. Click on “Value Your Vehicle” under the Valuation tab on the top bar. Select the model, year, and configuration of Fiat 124 Spider you are inquiring about. View the valuation results and compare the listed Fiat’s advertised price to the valuation. Compare the car’s condition to the different condition categories. Tip: Most show quality cars are excellent condition with daily drivers being either good or fair condition. Only the top 1% of vehicles are concours quality. If the advertised price is close to the valuation on Hagerty, continue with the sales process with the seller. Even if the valuation is close, it’s always a good practice to try to negotiate a better price. Once you’ve found a car that you’d like to buy, you’ll need to complete the sale and get the car back home. Step 1: Complete a bill of sale with the seller. Fill in the buyer’s and seller’s information, the vehicle year, make, and model, the odometer reading, and the sale price. Both the seller and the buyer should sign and date the bill of sale. 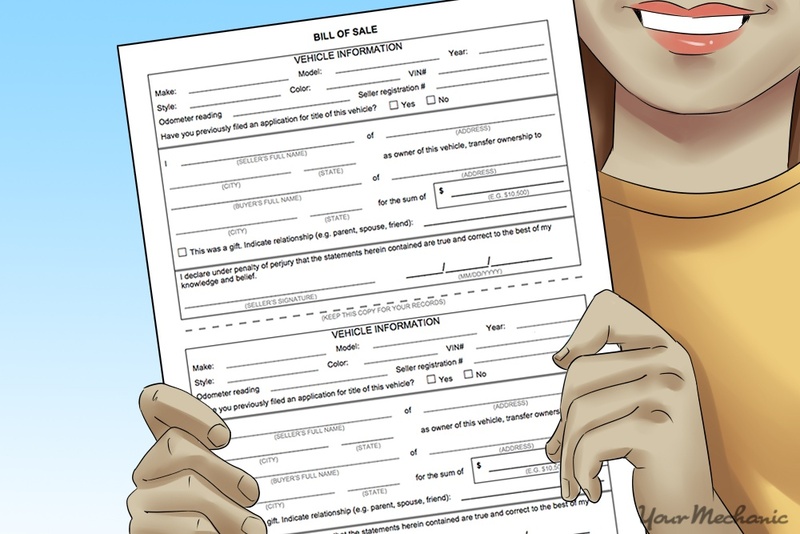 If you are buying a car that is not close to you and you aren’t completing the sale in person, complete your portion of the form and scan it to the other party or fax it back and forth. Step 2: Arrange your payment to the seller. Agree to a method of payment that is secure for both parties - typically a certified check, a bank draft, or an escrow service like PaySafe Escrow. Step 3: Determine how you are going to get your Fiat 124 Sport Spider home. If the car is within a distance you are willing to drive, arrange for either a flight to the city where the car is located, or a ride from a friend to the car’s location. You can have your Fiat shipped to its new home as well. UShip.com allows you to post an ad for the shipping service you require and receive bids from shippers to get the car to you. Step 4: Pay for your Fiat 124 Spider. If you are driving the car home, provide payment to the seller when you go pick the car up. If you are having the car shipped, send the payment to the seller. The seller won’t release the car to you or to a shipping company until they receive payment in full. Your classic Fiat 124 Sport Spider isn’t a new car anymore, and may require repairs often. Always try to buy a Fiat that is in top condition, complete, and original. It can be difficult to find replacement parts for repairs on modified vehicles because they aren’t original equipment and won’t be listed as a direct fit for your car. If you have any doubts as to the condition of the Fiat you are purchasing, have a mobile mechanic such as one from YourMechanic come out to perform a pre-purchase inspection to ensure that you get the value you are paying for. Q: Brakes no longer working.